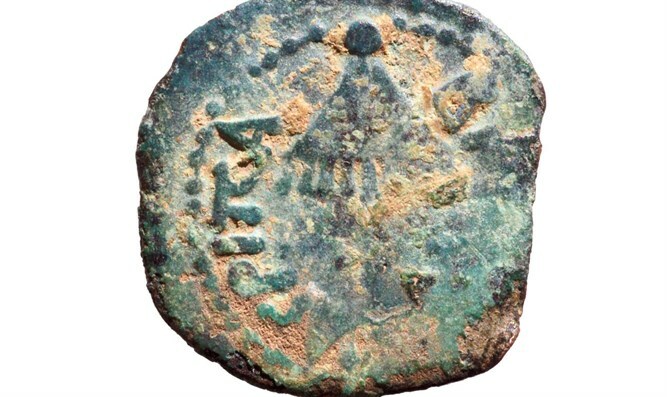 During school field trip, student finds coin bearing the inscription "King Agrippa." A student found an ancient coin in the eastern part of the stream during a recent school trip to the Shilo Valley. The student asked the group’s tour guide about the coin, who then contacted the officer in charge of the Archeology Staff of the Civil Administration who came to the group. The student then handed the coin over. The coin seems to be from the time of Agrippa I, who was a descendant of the Hasmonean dynasty from the Hanukkah story and the grandson of Herod. He ruled Judea in the 40s of the first century CE. The coin has three stalks minted on one side, and the other side has a royal canopy surrounded by the inscription “King Agrippa.”. “It is an exciting find. Every archaeological find has a story behind it that sheds light on the history of Land of Israel and the Nation of Israel,” said Hananya Hezmi, an officer of the archaeology staff at the Civil Administration.